In a November 2016 file photo, Connor Harris contributes to a 42-28 win over Missouri Southern State University. Lindenwood, winners of three straight against Missouri Southern State, looked to keep that streak intact in its latest game in Joplin, Missouri. And Saturday night, it certainly did. Lindenwood took care of MSSU, defeating the team 51-13 with an aerial attack that consisted of 270 passing yards and four touchdowns. All four of those went to redshirt junior Erik Henneman, who broke the school-record for touchdown receptions in a game. After last week’s loss, head coach Jed Stugart reiterated that Henneman represents great importance for this Lions team, and it’s crucial that they get him the ball more. Henneman turned his one reception for five yards, from last week, into an eight-receptions-for-74-yards performance that included 14 targets. The volume was certainly there for the tight end in the passing game, however, Lindenwood’s rushing attack was what began the scoring outpour. After punts to start the game for both teams, Lindenwood leaned on running backs Nash Sutherlin and Cam Sanders for their second drive. Sutherlin quickly rattled off two rushes of 17 yards, while Sanders topped the possession off with a 10-yard score to put the Lions up 7-0 midway through the first quarter. Another punt for MSSU gave the Lions the ball with six minutes remaining in the first. Sanders’ 24 yards worth of rushing and a big 24-yard reception for sophomore wide receiver Jarrett Johnson set up the Henneman touchdown grab to put the Lions up 14-0 with two minutes left in the quarter. A three-and-out for MSSU gave the Lions the ball for their fourth drive in the first. They once again fed Sutherlin play after play, and his 32 yards from scrimmage eventually led to a 12-yard touchdown pass to Henneman that put Lindenwood up 20-0 at the top of the second quarter. MSSU finally responded after giving sophomore Caleb Batie a chance to carry the ball. Batie ripped off a 53-yard rush on his first carry of the game, which put the MSSU offense deep in Lindenwood territory. Two plays later, a quarterback keeper by junior Sean Kelly gave MSSU their first score of the game, making the contest 20-7. After Lindenwood’s first three-and-out of the game, the Kelly-led offense put together a 15-play drive that resulted in a 33-yard field goal from junior Paul Wolff, to cut the Lindenwood lead to 10 with about five minutes remaining in the half. The last score of the first half came again from Wolff, who converted a 37-yard field goal to score what would be MSSU’s final points of the game. The second quarter displayed a Lindenwood team whose playing style was certainly stagnant. This left many to wonder how they’d respond at the start of the second half. In spite of this uncertainty, the Lions came out even more dominant than at the start of the first, scoring 28 points in the third quarter alone. It all started with a Lindenwood drive 11 minutes into the third. The whole drive, quarterback Cade Brister and Sutherlin went back-to-back with rushing attempts, tallying up over 65 rushing yards between the two. 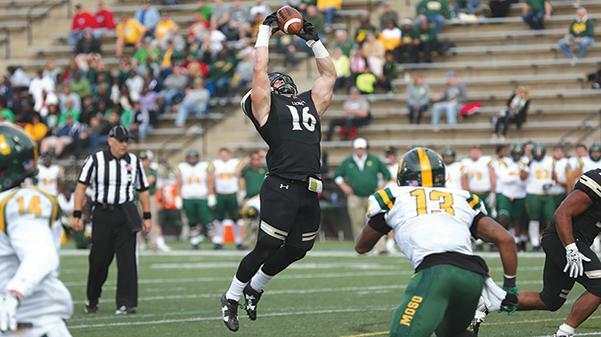 This set up Henneman’s third touchdown grab of the game to put Lindenwood up two possessions at 27-13. The next MSSU drive led to the first of their three turnovers in the quarter. On Kelly’s 2nd passing attempt of the half, the junior was intercepted by sophomore defensive back Grady Daniels, who returned the pick 50 yards for a Lindenwood touchdown. Less than a minute later, Kelly once again gave the ball up and fumbled. Sophomore defensive end Arsante Conners recovered the ball and gave the Lions great field position to set up Henneman for his fourth and final score of the game. The following kick-return for MSSU was once again coughed up. Their freshman linebacker Thomas Smith fumbled the return, which gave Lindenwood freshman Cam Holman the opportunity to recover. The recovery lead to Sanders’ second touchdown of the game to put the Lions up 48-13 with a minute remaining in the third. Lindenwood’s sophomore kicker Barrett Foley capped off the game with a 32-yard field goal late in the fourth quarter. The next game for Lindenwood is back home next Saturday for Family Day, when they take on the Bronchos of Central Oklahoma at 7 p.m.